As we nudge towards spring, it’s good to see such a varied mix of projects in development, in production and heading out on the road. Here’s a short round up of interesting work to look out for in the coming months. Our Technical Team have just returned from a recce in Mumbai where they’ll be helping deliver a spectacular wedding. On the scale of a small ceremony, the celebrations include an aerial element with our team providing a bespoke flying truss structure, hoists and control. This month sees our fourth year at Barcelona’s Mobile World Congress and we have a substantial crew heading out next week to install some complex branded structures and environments for this flagship event. 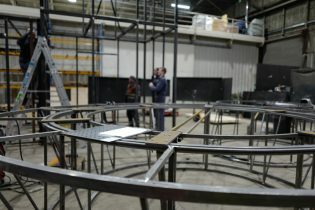 It’s been great to watch this project take shape in the workshops and see the structures fully test built in our hangars. We also have crew down at Battersea Evolution installing, amongst other things, a large multi-level stage for a prestigious corporate event. Having worked on recent projects at the Design Museum including last year’s Ferrari retrospective, April sees us return to help deliver a new world-class exhibition. We’re also modifying one of last year’s projects and taking it out to Milan Design Week; and later this spring, we’re delighted to be collaborating with The Serpentine Galleries for the eleventh year on their 2019 summer pavilion. More on all these projects to follow.